Mother Tongue Influence - Accent is more than Language, it's Culture! "I want to sound like a native speaker. Help me reduce my mother tongue influence!" Many believe this MTI or mother tongue influence will reduce or disappear by learning English phonetics. 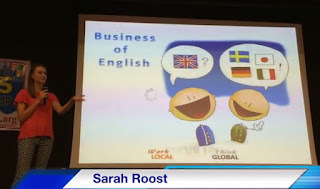 Some prospective clients want to focus only on sounds - how to make an American R or how to distinguish V and W or how letters/sounds like nt/mp/ng are problematic when said in English words (for Malayalam speakers). While others fear learning MTI because they feel they are too old or don't have enough energy or desire to change their 'accent.' Guess what, that's ok! Why? Well, for many changing one accent - learning to create new sounds does become more difficult after a certain age BUT this is NOT the only only element to reducing MTI. This is only one part of it, one small part of it. I have met professionals that can communicate very effectively with a foreign accent with Americans. I also met Indians and other foreigners in the US with neutral accents who would never be understood by an American. Why is this? It is because LANGUAGE IS MORE THAN SOUNDS. While phonetics, intonation and pacing is important, ignoring cultural elements of how language is used can spell disaster to even those with the most perfect, global, neutral accent. Third culture kids can probably tell you the best! Let me narrate this with a story. On one of my trips to the US, I met my friends who were settled in the US, but originally from Kerala. They were so excited to see me, and demanded, "Say something in Malayalam!" So, a natural expression for me as an American is to ask, "Sugam anno?" (Are you fine? / How are you?) This was met with hearty laughs. Were they laughing because my accent was bad? Were they embarrassed for me? So I said, "Oh sorry, I can't speak in Malayalam, teach me how to make a good Malayalam accent!" They said to me, "No, it's not that. You sound fine." "Why did you laugh at me?" I asked. "We never ask that in our culture. When we meet face to face we can see each other. By seeing me you should know!" I was happy they were so free to tell me this! Any foreigner in America knows if an American wants to learn your language, 99% of the time the first phrase any American wants to learn is 'How are you?' because that is an important greeting in the US. But, as this taught me, it is not so important in other cultures! So, I had a problem with my Mother Tongue Influence here. My MTI taught me as an American it's polite to ask how are you every time I meet someone in any context. My Malayaee friends taught me that in their cultural context it may be better to ask 'Ende vishesham' if you are seeing the person (meaning: What news? or What's up?). I am no expert in Malayalam, so what I report to you is from my friend's mouth! Let's take another example to demonstrate this. So in Kerala or in India in general, what is a local language way to answer the phone? In training programs when I ask, participants start off by saying things like "Namaste" or "Namaskaram" or other extremely polite forms which are rarely ever used, eliciting the audience to break out into a hearty laugh. So, the word I am looking for in Malayalam starts with a P, in Hindi, a B and in Tamil an S. I am not familiar enough with other Indian languages to quote them here. So did you think of the word? It's a word that means "tell me." Of course in Indian languages there are rude, polite, and informal ways to say versions of pariyu (Malayalam), bolo (Hindi) or solla (Tamil). But, when translated into English, we can only say "tell me" which is not used by native speakers in Western countries as a friendly greeting to answer the phone or encourage someone to speak. Instead we must find new ways to use our language in a culturally appropriate way to influence, build rapport and gain business. I believe this is where we can all benefit from MTI reduction techniques whether we are an Indian learning to use English effectively with an American or an American learning to use English effectively with Indians. Even the best, most polished accent can still cause problems if we don't know these subtleties. Do you want to learn more about polished business communication with Americans or American business culture to more effectively manage stakeholder meetings or client interactions? Read some of our success stories or check out our programs here.